After you color the tips, you write one word towards the other end of the stick. I tend to use about 15 sticks for a vocabulary-themed set. Three of those sticks will have the word "Caramba" written on them. The rest will have vocabulary words you want kids to review. 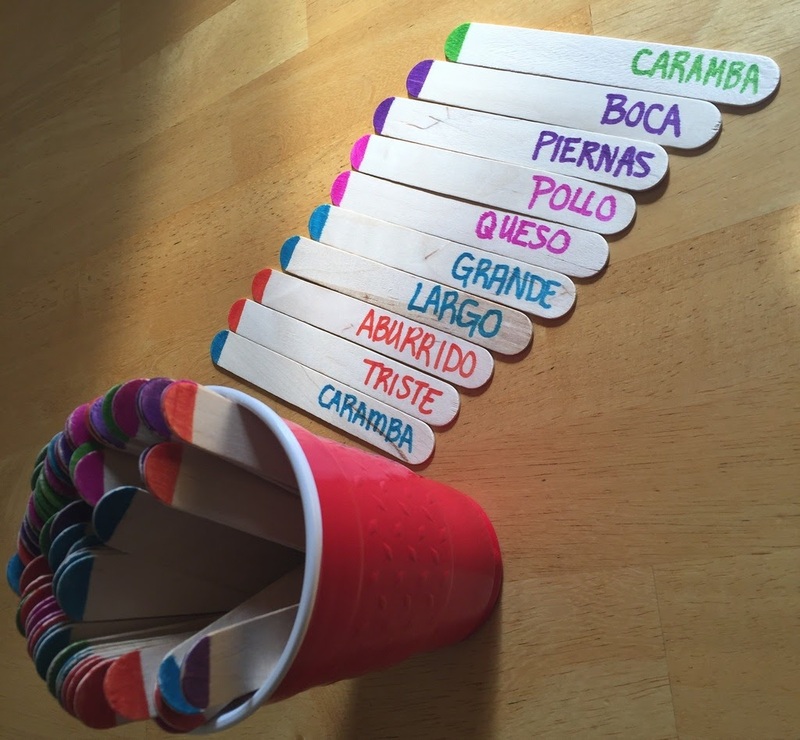 To play the game you put one set (or maybe two or three if you have more advanced students) in a cup with the colored tips up. Students take turns pulling a stick out of the cup and giving the translation of the word. 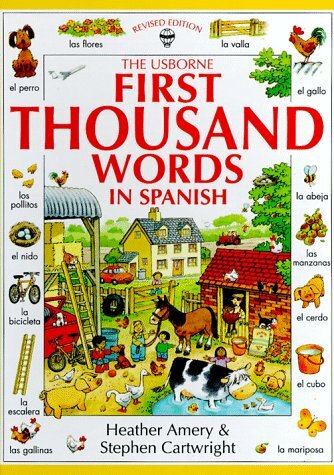 They keep the stick if they can say what it means in English. Otherwise, they put it back in the cup if they don't know. If they pull a "Caramba" stick they have to put back ALL their sticks! I time the game for about three minutes. The student with the most sticks at the end wins! This is a fun way to review vocabulary which at times can be tedious! This vocabulary method seems awesome for kids to challenge themselves in Spanish. Thank you for this post! I teach three levels of Spanish and I am always looking for activities to practice vocabulary. Any tips on teaching preterito and also subjunctive? Any fun games to review with them? I have a couple of posts on verbs that might help. 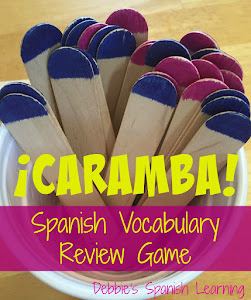 You can search for these in the sidebar search box... Learning with dice, battleship for verbs, Story Cubes for verbs, and you can also take this game "Caramba" and make sticks for verbs. 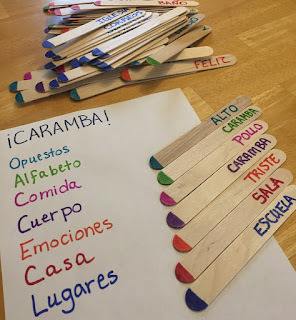 Put the infinitive and a subject pronoun on each stick. When a student pulls one out he or she must conjugate it in the correct form to keep the stick. Hope that helps! Great idea, thank you for sharing!! How do the students know if they've got the word correct? Is the English on the other side or on a list? Great idea BTW. I teach three levels in the same period! If they aren't sure, I have them check their notes or ask me. However, I find that there are normally one or two students that know whether it is right or not especially if they are in groups of five or six. Me gusta su blog. A veces se nos olvidan las ideas o necesitamos más ideas como estas. Gracias por compartir. How might one use this game without translation into English? Maybe by using opposites or synonyms or associating actions? I replied below to your question. Profesora Daniels- Yes, using opposites would work! Other ideas...on the sticks could be body parts and the students have to say an action that is done with that body part. Or there could be foods and the student has to call out the color of the food. Hope that gives you some ideas. I would make them say a sentence with the word. Great ideas! Can't wait to try it!